The Vestil PLP2-4840-ORANGE polyethylene pallet is a platform that has grid-shaped decks and fork openings on all four sides, can be used to support and transport goods, can be lifted using a pallet truck or forklift truck (sold separately), and is orange in color. The pallet is made of polyethylene, which won’t splinter like wood can, may be wiped clean, and is resistant to dents and corrosion. Fork openings on all four sides allow the pallet to be accessed with a pallet truck or forklift truck from any side. The grid-shaped decks allow liquid to drain. Two or more pallets can be stacked for storage. This pallet may be available in other colors, allowing different types of loads to be identified and segregated in a warehouse or stockroom. 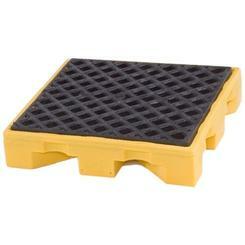 This pallet has a static load capacity of 6,600 lb. and a dynamic load capacity of 2,200 lb., weighs 38 lb., and measures approximately 6 x 48 x 40 inches (H x W x D). (H is height, the vertical distance from lowest to highest point; W is width, the horizontal distance from left to right; D is depth, the horizontal distance from front to back.) Each fork opening measures 4 x 9-3/4 inches (H x W). This product is intended for use in professional and industrial environments. Pallets are low platforms that can support heavy loads, and that can be lifted and transported using a pallet truck or forklift truck. Pallets can be made of wood, polyethylene, steel, aluminum, cardboard, or other materials. Loads may be bundled and secured to the pallet using straps or stretch wrap. Four-way pallets can be lifted and moved with a pallet truck or forklift truck from any side. Pallets may be color-coded for identifying and segregating different types of loads, or to indicate load capacity. The International Organization for Standardization (ISO) recognizes six standard pallet sizes, with the most common size in North America being 48 x 40 inches (W x D). Pallets without a bottom deck are called skids. Pallets can be used in warehouses, stockrooms, manufacturing and shipping facilities, and other industrial environments.